Death records are especially helpful because they may provide important information on a person’s birth, spouse, and parents. It’s a good idea to first look for death records because there are often death records for persons who have no birth or marriage records. 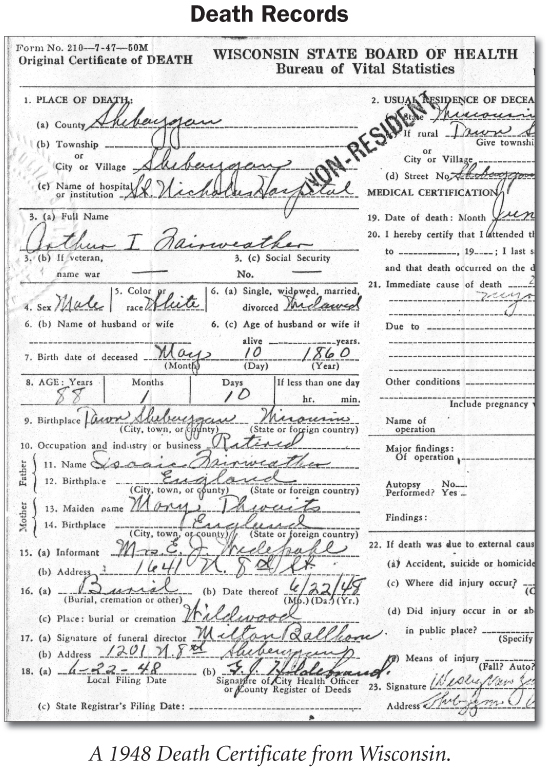 Early death records, like cemetery records, generally give the name, date, and place of death. Twentieth-century certificates usually include much more (see below). Death certificates may be filed in the state where an individual died and in the state where he is buried. The Social Security Death Index contains over fifty million records of deaths reported to the Social Security Administration from 1937 to 1995 — however, the bulk of the records are from 1962 and later. TIP: When using the information found in death records, it’s important to remember that the informant (because he might not have had complete information) may have accidentally provided some inaccurate information. For example, children of immigrants frequently never knew their “old country” grandparents and had to guess at their names. The same is also true of birth dates and even places. But, it can also be filled with great clues like: informants, cemetery names, funeral homes, etc.! 2) Family History Library — has copies of many death records (primarily those before 1920) and many statewide indexes. Check the FHL Catalog for the State, County or Town where the death took place. 4) Counties or Towns — these jurisdictions usually kept records before the states did. Go to this site for specific information on where to send (and the cost) for the locality where the death took place: http://www.vitalrec.com Also, see pages 9.10-11 for info on how to find county records. 5) Internet — some death indexes and records are online. Go to http://www.cyndislist.com and check your state.